﻿ Cristiano Ronaldo to CNN: "My competitive nature is often perceived as arrogance"
09.11.2012 » Ronaldo to CNN: "My competitive nature is perceived as arrogance"
Cristiano Ronaldo granted an interview to CNN earlier this week and if there were any doubts on how much the Portuguese player wants to win the upcoming FIFA Balon d'Or, they certainly vanished right after the first answer. Ronaldo admits he holds high hopes of winning this prestigious award, but didn't hide his concerns that his bad public image might interfere when the time comes to decide who was the best player in the World in 2012. The Portuguese forward recognized that the way he usually behaves on the pitch is the main cause for the misleading idea that the media and many fans still have of him being an arrogant person. However, Ronaldo also assured that they couldn't be more wrong in that regard and that such a deceptive concept is only possible because they don't know the real Cristiano Ronaldo. The campaign to win the FIFA Balon d'Or this year is being played outside the football grounds like it has never been played before. If the decision was to be made accouting for only what one has done in the football pitch, at this stage Ronaldo could very well be pointed as the main favorite to take the award home next January, thanks to his decisive contribution in leading Real Madrid to win the Spanish League 'La Liga', as well as carrying Portugal on his back right until the EURO 2012 semi-finals. Messi in the other hand, has scored an outrageous amount of goals (50 in La Liga), but has failed to win any major title with Barcelona, as he saw Real Madrid taking the edge domestically, succumbed against an heroic Chelsea side in the UEFA Champions League semi-finals and obviously didn't have the chance to play on this summer's European Championship. If the equation to win the FIFA Balon d'Or was the one mentioned above, Ronaldo would clearly be on the front line to be elected as the Best Player in the World for the 2nd time in his career. However, it doesn't seem to be all that simple anymore and the voting will not be made strictly based on how a football player performed for his team/nation during the year. There's another factor coming into game and let's just call it the "X Factor", which has to do with the public image certain players can have and that can either play in their favor or against them. Ronaldo's controversial character everytime he competes, as well as his authencity and honesty when he talks with either a closest friend or a journalist he faces for the very first time, have undeniably generated a lot of hate and criticism against himself. The Real Madrid forward is well aware of that fact, but assures that it is a completely wrong idea people have about him, justifying his behaviours when playing as being driven by his constant competitive nature. Nevertheless, Ronaldo himself seems to be sensing the unfair outcome of the next FIFA Balon d'Or gala next January 7, 2013, and unfortunately, there's not much he can do now to revamp his public image, no matter how many interviews he grants. Barcelona's Lionel Messi will remain being pointed as the main favorite to win his 4th straight Balon d'Or award and if he really ends up winning it, maybe it's time for the award itself to be renamed and start being called "The Best Football Player and Person in the World", as it would reflect a lot better what people who vote actually take into account when deciding who deserves it the most. Pedro Pinto (CNN journalist): "We're approaching the end of the year and that means the FIFA Balon d'Or is around the corner. Be honest with me: how much do you want to win it?" Cristiano Ronaldo: "A lot... This would mean a lot to me." Pedro Pinto: "So if you were someone voting and then someone asked why are you going to pick Cristiano Ronaldo over Lionel Messi, what would you say?" Cristiano Ronaldo: "Well, I would try to put everything together in order to see what each player has done and won at the end of the year. Since you mentioned my name and also Lionel Messi's, we would have to ask who won more things, who played better, who ended up winning the most important trophies. I cannot say I'm the one deserving to win it, but I do think I'm in a good position..."
Pedro Pinto: "I spoke with some journalists who voted for the last award that I was presenting in Monaco, the UEFA European Footballer of the Year [which Andrés Iniesta won], and some of them may have voted for Messi because they like Messi more than they like you. Not due to his football, but due to his public image instead. Do you think that sometimes you're a victim of your own image?" Cristiano Ronaldo: "I don't want to cry about that, but sometimes I do think I am. It's a question for which I can never give the 100% right answer, because sometimes I honestly don't know... I have to agree that in a few occasions I end up sending a bad image of myself on the pitch, because I'm always very serious when I play. But if you really know me, if you are a friend of mine, if you have the opportunity to live under the same roof with me or if you share a day with me, you will know that it's just a sign of my nature, since I hate to lose!" Ronaldo: "Just to give another example, when I'm in the swimming pool with my girlfriend (Irina Shayk), we like to do a swimming race. We all have plenty of occasions where we have to give our beloved ones the opportunity to be happy, but in that case, I always win those games because I don't like to lose! It's as simple as that. I'm an extremely competitive man and I often see people interpreting that in a different way, which is a shame because I don't like it, but I've learned to live with it." Pedro Pinto: "So when they say you're arrogant for example, what does that make you feel?" Pedro Pinto: "Who is the real Cristiano Ronaldo?" Cristiano Ronaldo: "Well, I would describe myself as a good friend of who is also my friend; I hate to lose; I'm honest and a straight forward person..."
Pedro Pinto: "So do you think you're paying the price for being too honest then?" Cristiano Ronaldo: "Yes, sometimes I do... definitely yes. But who I am is part of my education." Pedro Pinto: "Talk us a bit about your relationship with José Mourinho"
Cristiano Ronaldo: "My relationship with Mourinho is perfect. I'm sure 100%, even 200%, that he is the best coach in the game. He deserves that status because he showed in every country where he has been that he is the best because he won all the leagues he could. In my opinion, the best coach in the World has to prove himself in many places and he has done that repeatedly." Pedro Pinto: "You know I spoke with Mourinho recently and he told me that sometimes he wishes that he could turn off a switch and that no one would recognize him so he could have a normal life. Did you ever felt like that?" 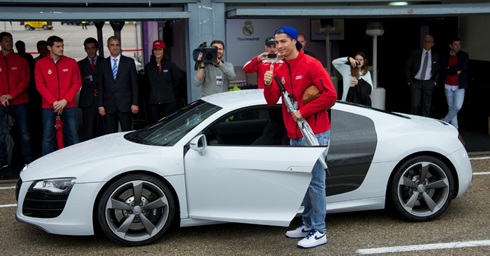 Cristiano Ronaldo: "Of course! Not just now, but over the last 5 or 6 years. It comes along with your job and the success though and it happens everywhere. Sometimes I wish I could go to the shopping, to Mc Donalds [smiles], not a great example but... just go to a coffee and not be recognized. But we are famous and that's the way it is so we have to deal with that. ", stated the Portuguese and Real Madrid star, when closing his interview to CNN. 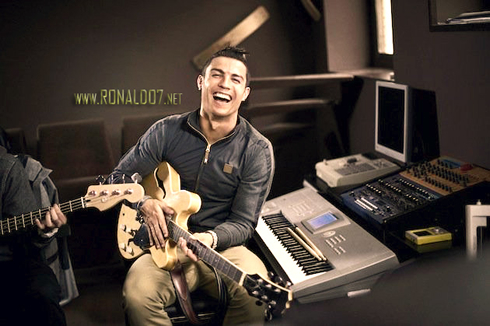 On a side note, you can read more about Ronaldo's latest campaign with Nike, from our friends at WorldFootballExtra. 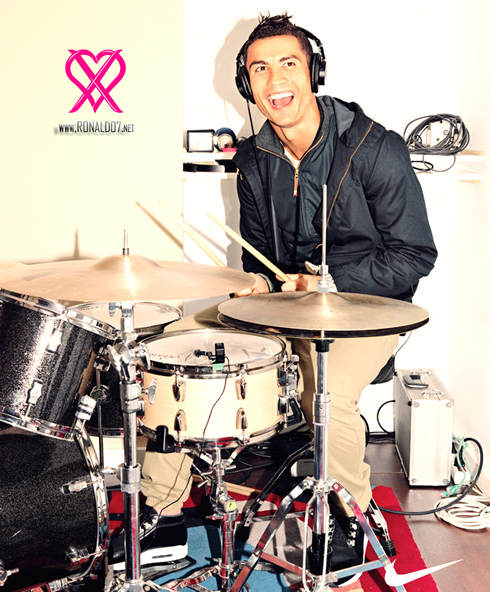 Ronaldo and Nike not only launched their new clothes collection, but the Portuguese player also played around with several music instruments. The new Nike football boots model shown on the article is called Nike Mercurial Vapor VIII - CR7 edition. Cristiano Ronaldo next game for Real Madrid will be against Levante, for the Spanish League "La Liga", this Sunday night (11-10-2012). In the meantime, you can watch Levante vs Real Madrid, Mallorca vs Barcelona, Aston Villa vs Manchester United, and Arsenal vs Fulham, all matches provided from our soccer live section.